Mallard Cottage01263 715779work01603 870304fax Self-cateringThis modern flint and brick property in the charming village of Blakeney is only a short walk from the quay. Offering wide rooms and contemporary outfittings, this cottage provides a luxurious stay. Boat trips are available to go and observe the natural wildlife of Blakeney point, which includes seals and migratory birds. Other: Towels, Tea towels, Books, Games, Travel cot provided. Note: Please bring your own beach towels. Access: Allocated off-road space for one large car plus one unallocated visitor's space in shared car park. Mallard Cottage offers weekly bookings starting on Friday. 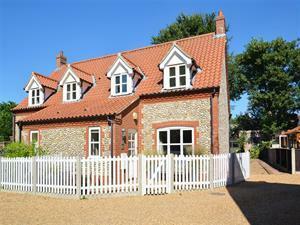 This modern flint and brick property in the charming village of Blakeney is only a short walk from the quay. Offering wide rooms and contemporary outfittings, this cottage provides a luxurious stay. Boat trips are available to go and observe the natural wildlife of Blakeney point, which includes seals and migratory birds.